The man who is accused of shooting a WDBJ reporter and cameraman on live TV and then himself Wednesday morning was fired from the news station around two years ago and reportedly sued another TV station for racial discrimination. Vester Lee Flanagan II, who went by the name Bryce Williams on air, filmed himself fatally shooting cameraman Adam Ward and reporter Alison Parker while they were interviewing someone for a live television shoot near Roanoke, Va. The 41-year-old Flanagan reportedly sent a series of tweets claiming that Parker used racial epithets while at work. He also complained of being fired unfairly. According to ABC News, a fax purported to be from Bryce Williams was received by the news agency. That fax has been turned over to the authorities. 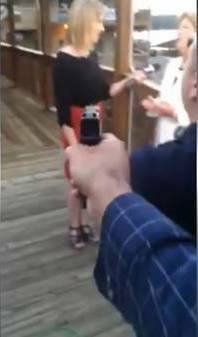 Videos of the shooting are available. The video provided by Mediaite cuts off just before the shooting begins. The former television reporter who gunned down two journalists and wounded a third person on live television Wednesday morning — apparently out of anger over the Charleston, S.C., church shootings — killed himself as police closed in on him along a Virginia highway. A picture is emerging of 41-year-old Vester Lee Flanagan, who professionally went by the name Bryce Williams, as someone who was difficult to work with, easily offended and sometimes feared in the newsroom. In between his murderous rampage Wednesday morning and the time he ended his life with a self-inflicted gunshot wound before Noon, Williams sent a manifesto full of his angry ranting to ABC News. In the faxed document, Williams used the June shooting at a Charleston church as part of the reason for his crime. Williams also listed numerous grievances including racial discrimination, sexual harassment and bullying while at work. Williams said he was attacked for being a gay, black man. Williams filed a complaint, alleging racism, with the Equal Employment Opportunity Commission, though Marks said that charge was dismissed.